Coming out of Microsoft’s Dream.Build.Play. contest was one particular co-op title that managed to score second place overall. Max Blastronaut places you in command of the titular hero who is charged with defending his little piece of the galaxy from the evil Dredge Miners; a group of space farers that roam the universe plundering entire galaxies for fuel and leaving destruction in their wake. Poor Max doesn’t have it too easy, but fortunately, he can bring along three friends to help take down the Dredge. 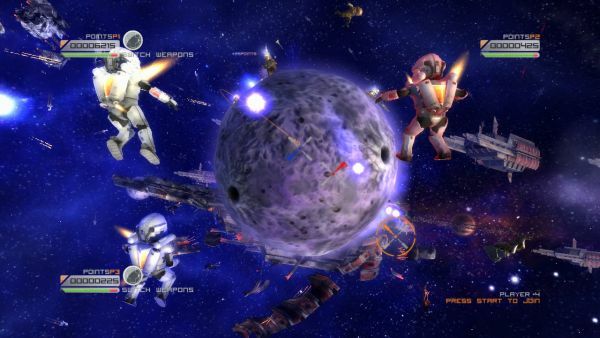 Max Blastronaut plays like a 3D brawler mixed with the original Star Fox on the SNES. As Max runs around a planet that is about the size of a Super Stardust HD world, enemies will pop out of holes in the surface and start punching Max. So what do you do? You punch right back, of course. Pressing the ‘B’ button causes Max to flail his tiny little fists at his foes in order to fight them off. 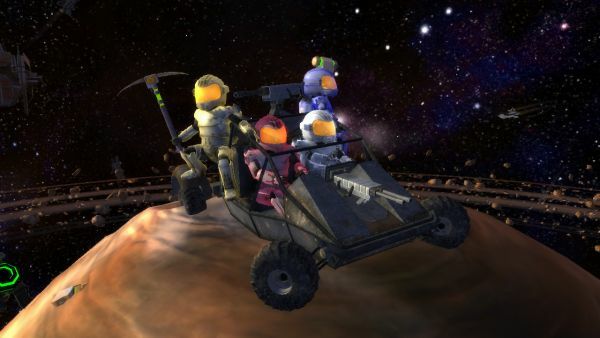 Some of the miners carry weapons appropriately suited to their profession, i.e., pickaxes and shovels, and grabbing these will cause Max to spin around in a circle, hitting any enemies that get in his path. Should things get a bit too hairy, though, you can press the left bumper and Max will blast off from the planet’s surface and get out of harm’s way. From this vantage point, Max hovers overhead and can rain down hot laser death on the enemies below. You’re only able to do this for a short period of time, but even a little bit of a break from the enemies that are swarming the little blastronaut is enough to gain an advantage when needed. Max is also able to fly around the planet as he’s hovering, so it’s possible to fly up, shoot a few enemies, and then land on the other side out of harm’s way. As Max overcomes the waves of enemies, the planet begins to shrink in size, leading to a greater cluster of enemies and another interesting twist. With a smaller planet, Max’s laser blasts will go all the way around the planetoid; meaning should you miss a miner with your initial shot, it’ll wrap its way around and may come back to hit the miner from behind. The best part about Max Blastronaut, as mentioned at the beginning of this post, is the inclusion of 4 player drop-in/drop-out local co-op. While there aren’t any additional co-op moves available to help you and your friends take down the Dredge Miners, having a few buddies along always makes things easier. In the time that I played the game, the PR person that I was playing with and I would alternate who was on the planet, and who was providing air support. Given the limited amount of time that you can spend hovering overhead, we sometimes would go back-to-back to beat down on the baddies. While we only played through one level that was pretty much a tutorial level, I was told that future levels would feature power-ups for the blastronauts, new blaster weapons, and even vehicles. No word yet on when exactly the game will be released, but you can be sure that we'll let you know as soon as you can download it via the Xbox LIVE Indie Games channel. Page created in 0.6057 seconds.